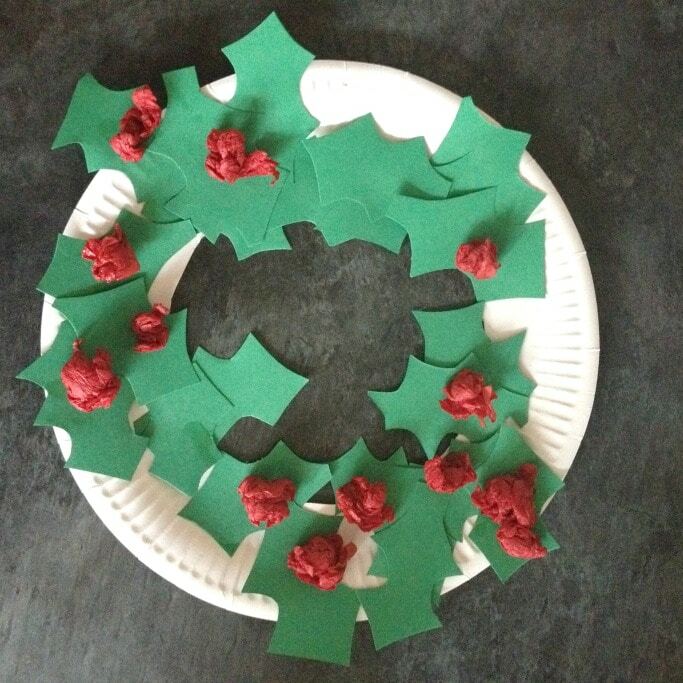 At the beginning of autumn we made a paper plate wreath which we decorated with real leaves which we really enjoyed doing. To celebrate Christmas, or more importantly, the fact that I’ve got a stack of paper plates, I thought we could try to make a paper plate Christmas wreath. I’ve seen some really cool Christmas wreaths on Pinterest but understandably a lot of those seem beyond the skills of a three year old! So being inspired by the holly on our walk to playgroup I thought we would make a little holly wreath. Because my son is three I’m trying to make an effort at the moment to make things look nice when it comes to making things. I guess it’s kind of like an invitation to play but more an invitation to craft. Things seem much more enticing when they’re better presented and he doesn’t have to sit and wait for me to do things! 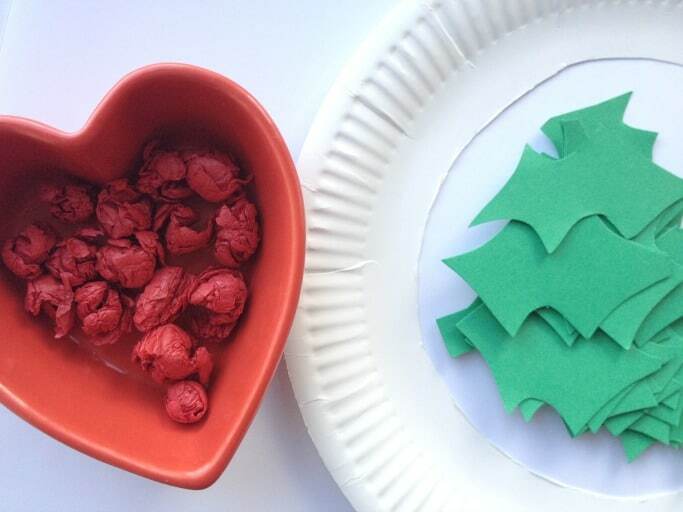 So while he was at playgroup I cut out the middle of the paper plate, cut out the holly leaves and scrunched the red tissue paper into holly berry shapes which I put into a cute heart shaped dish. I also filled up his favorite tube of glue which is apparently the only one that must be used. Because he is three. I made sure I pointed out the holly tree on the way home and then I set him loose! I think it looks pretty cute and I’m planning on decorating his bedroom door with it for Christmas. Previous Post: « When should you teach your kids to ride a bike? That’s so sweet! I also have a stack of paper plates, can’t wait to try this out later. What a pretty wreath! I’ll definitely give this a try with my son! 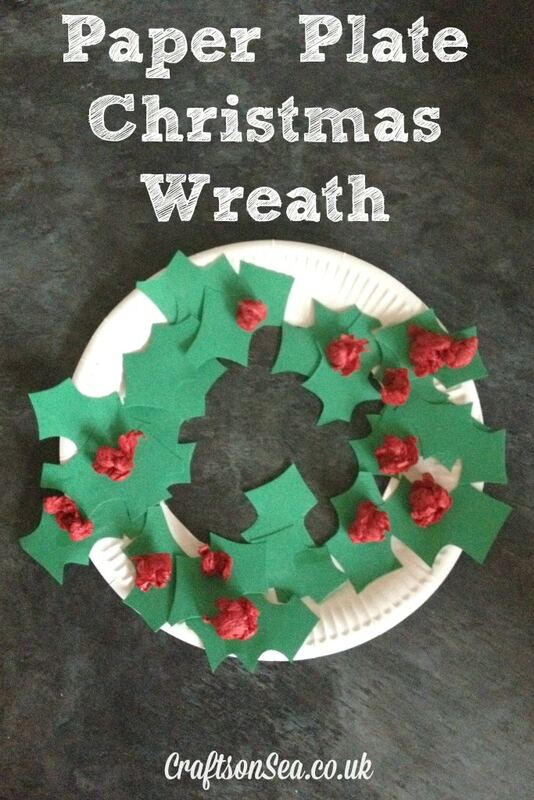 Lovely christmas craft, simple and fun. This is so beautiful and so simple, I can’t wait to try it with my two. It will even be lovely for my young toddler – thanks for sharing!